Rutilated Quartz is in fact a combination of two minerals, Quartz and Rutile, where the rutile exists as an inclusion, or “impurity” within the quartz’s crystal structure. So, to understand Rutilated Quartz, one must first understand these two component minerals. Quartz is Silicon Dioxide (SiO2), which makes up 12% of the earth’s crust and is the world’s second-most prevalent mineral. In the case of Rutilated Quartz, it is macrocrystalline in structure, meaning it forms as clearly visible crystals to the naked eye, a result of the internal structure of the crystals repeating their pattern over a relatively long distance. Rutile is the most common known natural form of Titanium Dioxide (TiO2). Its name is derived from the Latin “rutilus”, meaning red, an allusion to its tendency to be a dark red in colour, but in fact it can be found in shades varying from gold to red, brown, silver, metallic black and jet black. 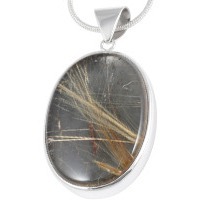 Rutile crystals form as prisms that can be so long and thin that they often resemble fine hair. They commonly form as twins, or sprays of 6 or 8 crystals, the effect resembling a star. It’s often the presence of closely arranged microscopic rutile needles as inclusions in certain minerals that is responsible for asterism, the appearance of a star of light radiating from a stone. The fine needles, which intersect with each other and are specifically aligned with the crystal structure of the stone in which they’re present, capture and reflect light to form a star. This explains the phenomenon in star ruby, star sapphire, star rose quartz and a host of other “star gems”. 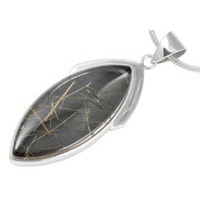 Rutile is a major source of the metal titanium. It is also used in the production of a brilliant white pigment used in paints and other products. When reduced to nano-sized particles, because it allows visible light to pass through it but absorbs ultraviolet light, it is used in the production of sun-block. Rutilated Quartz formed within newly forming quartz veins when crystals of quartz grew inward to the centre of the evolving veins, where rutile crystals were already present. 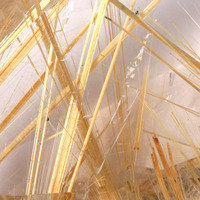 As the quartz crystallized, it enveloped the rutile crystals that had preceded it. Consequently, Rutilated Quartz specimens often display rutile crystals that seem to enter from one side of the quartz crystal and exit on the other side. Generally the rutile inclusions will vary from only 0.1mm to 1mm in diametre. They may either traverse the quartz crystal in carefully aligned parallel lines, or radiate like a star from central points, or cross each other in a random mass. The quartz component of Rutilated Quartz may vary from totally clear to milky and opaque in appearance. One may also find rutilated smoky quartz as well. The smoky quartz is formed when quartz is exposed to natural radiation due to the decay of radioactive elements in close proximity. Rutiles have also been known to occur in conjunction with other inclusions such, as those that occur in lodolite. 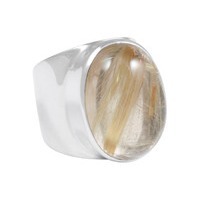 The rutile crystals themselves may vary in colour, concentration and formation as well. Some examples will display sparsely arranged sprays that are almost unnoticeable, yet others will be a literal tangle of hair-like needles traveling in every direction, which are so densely packed that the quartz is no longer transparent. In other examples the rutile needles will all sit perfectly aligned in parallel lines, or will seem to radiate from one point like a star. Colours will vary from brown-red or pallid yellow and white that reflect little light to brilliant coppers, silvers and lustrous golds that sparkle like polished, precious metals. Sri Lanka produces a jet-black variety of rutilated quartz, which resembles human hair. 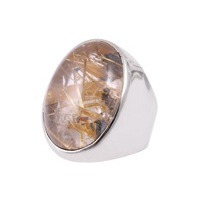 Rutilated Quartz is a highly energetic stone. Both Rutile and Quartz Crystal are, by nature, amplifiers, which means that each works to heighten the effect of the other. This is particularly noticeable with clear quartz, whereas rutilated smoky quartz will be far more stabilizing and grounding. This is a powerful energy integrator – the illuminator of the soul, which inspires a spiritual quest and guides the way to the higher mind. It provides insight during the journey, so that one can understand the path one is on. From a psychological perspective, Rutilated Quartz helps one to see the “root of the problem” and the underlying causes of distress and disease, so that the real problem can be addressed, and one can move forward. This even includes insight into past-life events. It heightens our intuition, allowing us to know whether a situation or a person is in our best interests. It is also said to provide insight during astral travel. Rutilated Quartz draws off negative energy, helping us to feel lighter and less overwhelmed. It is said to act as an antidepressant. It is credited with relieving self-hate, fear and phobias, such as agoraphobia. It helps us to succeed in our creative endeavors by maintaining our focus. Red and brown rutiles will assist us in removing any blocks to health and abundance. Golden rutiles will stimulate creative energy and prepare us for Divine inspiration. Silver rutiles will enhance our intuition. Physically, Rutilated Quartz is credited with helping to stimulate hair growth, heal physical wounds and relieve bronchitis and other respiratory infections. It is also said to balance the thyroid gland, improve posture, replenish physical energy and even absorb mercury from the body.